In this trailer the different teachers will give an introduction of the course. They will explain the content and study goals of this course. Water is essential for life on earth and of crucial importance for society. Also within our climate water plays a major role. The natural cycle of ocean to atmosphere, by precipitation back to earth and by rivers and aquifers to the oceans has a decisive impact on regional and global climate patterns. Global water cycle. In this module you will learn to explain the different processes of the global water cycle. Water systems. In this module you will learn to describe the flows of water and sand in different riverine, coastal and ocean systems. Water and climate change. In this module you will learn to identify mechanisms of climate change and you will learn to explain the interplay of climate change, sea level, clouds, rainfall and future weather. Interventions. In this module you will learn to explain why, when and which engineering interventions are needed in rivers, coast and urban environment. Water resource management. In this module you will learn to explain why water for food and water for cities are the main challenges in water management and what the possibilities and limitations of reservoirs and groundwater are to improve water availability. Challenges. In this module you will learn to explain the challenges in better understanding and adapting to the impact of climate change on water for the coming 50 years. Every module is made by an expert, so you will learn from different professors. Although the different topics are taught by different professors the course line is clear and will be explained and connected by our anchor man. Examples in the environment will be given by Max, our reporter on location. The course consists of knowledge clips, movies, exercises, discussion and homework assignments. The course will be finished by an examination. 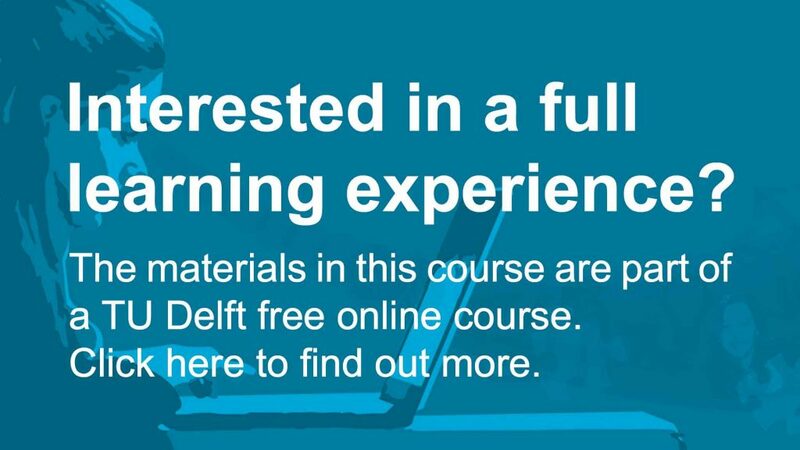 The best students (based on results and activity in the forum discussions) will be invited to follow an online course of the MSc-track Water management of the faculty of Civil Engineering at the TU Delft. Together with the courses “Introduction to drinking water treatment” and “Introduction to the Treatment of Urban Sewage” they form the Water XSeries, Faculty of Civil Engineering and Geosciences, TU Delft. Introduction to Water and Climate by TU Delft OpenCourseWare is licensed under a Creative Commons Attribution-NonCommercial-ShareAlike 4.0 International License. Based on a work at https://ocw.tudelft.nl/courses/introduction-water-climate/.